The commemorative USSR stamps of 1934 through early 1935 honor famous Russians, anti-war propaganda, and the luxurious Moscow subway system. 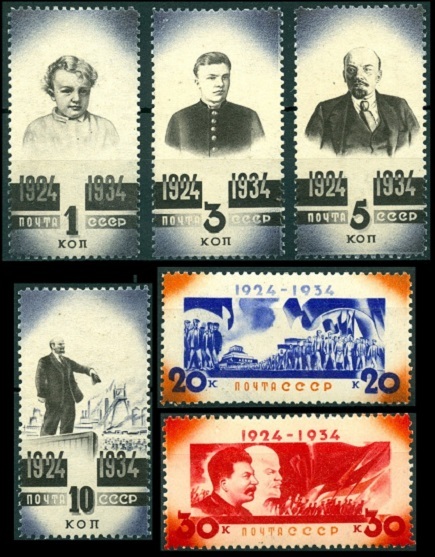 The five pictorial USSR stamps shown above were issued on February 7, 1934 to commemorate the 10th Anniversary of the Death of Vladimir Lenin. 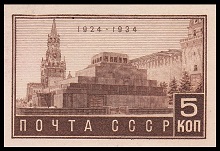 The common designs feature Lenin's Mausoleum in Red Square. 05 K. (1934 - Sc. #524) - Brown. 10 K. (1934 - Sc. #525) - Slate Blue. 15 K. (1934 - Sc. #526) - Dark Carmine. 20 K. (1934 - Sc. #527) - Green. 35 K. (1934 - Sc. #528) - Dark Brown. 05 K. (1934 - Sc. #524a) - Brown. 10 K. (1934 - Sc. #525a) - Slate Blue. The two pictorial USSR stamps shown above were issued on March 5, 1934 to commemorate the 350th Anniversary of the Death of Ivan Fedorov, the founder of printing in Russia. The central design features the statue of Ivan Fedorov (1525-1583) in the Moscow Print Yard. The background design shows Fedorov's printing press and a contemporary rotary printing press. 20 K. (1934 - Sc. #529) - Carmine Rose. 40 K. (1934 - Sc. #530) - Indigo. The two pictorial USSR stamps shown above were issued in March 1934 to commemorate the 15th Anniversary of the Death of Yakov Sverdiov (10 K.) and the 10th Anniversary of the Death of Victor Pavlovich Nogin (15 K.). 10 K. (Sc. #531) - Yakov M. Sverdiov (1885-1919), chairman of the All-Russian Central Executive Committee. 15 K. (Sc. #532) - Victor Pavlovich Nogin (1878-1924), chairman of the Russian State Textile Syndicate. 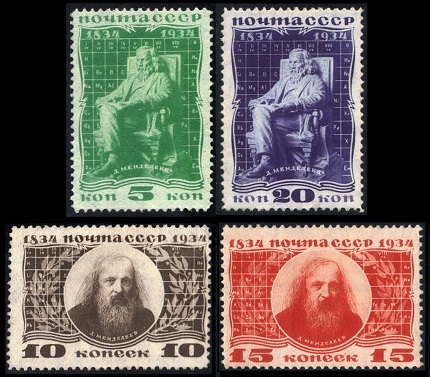 The four pictorial USSR stamps shown above were issued on September 15, 1934 to commemorate the 100th Anniversary of the Birth of Professor Dmitri I. Mendeleev. The two common designs feature the likenesses of Dimitri Ivanovich Mendeleev (1834-1907), the Russian chemist who discovered the Periodic Law of Classification of the Elements. 05 K. (1934 - Sc. #536) - Emerald. 10 K. (1934 - Sc. #537) - Black Brown. 15 K. (1934 - Sc. #538) - Vermilion. 20 K. (1934 - Sc. #539) - Dark Blue. 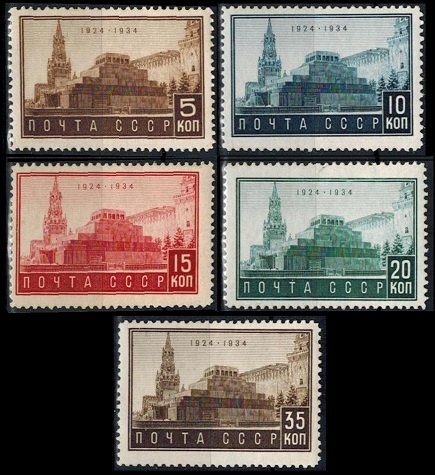 The six pictorial stamps shown above were issued on November 23, 1934 to commemorate the First Decade without Lenin. 01 K. (Sc. #540) - Lenin as a child. 03 K. (Sc. #541) - Lenin as a youth. 05 K. (Sc. #542) - Lenin in middle age. 10 K. (Sc. #543) - Lenin the orator. 20 K. (Sc. #544) - Demonstration before the Lenin Mausoleum. 30 K. (Sc. #545) - Lenin and Stalin. 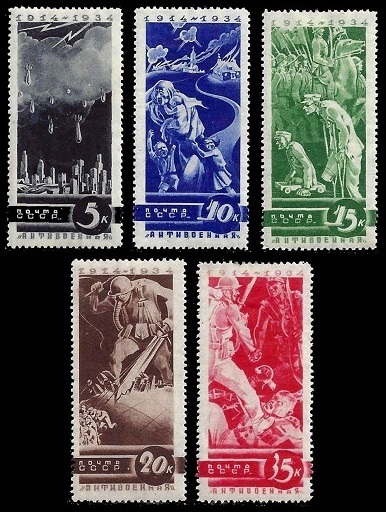 The five pictorial stamps shown above were issued on January 1, 1935 for anti-war propaganda, with the designs vividly depicting the horrors of modern warfare. 05 K. (Sc. #546) - Bombs falling on a city. 10 K. (Sc. #547) - Refugees from a burning town. 15 K. (Sc. #548) - Soldiers before and after a war. 20 K. (Sc. #549) - "Plowing with the Sword". 35 K. (Sc. #550) - "Comradeship". 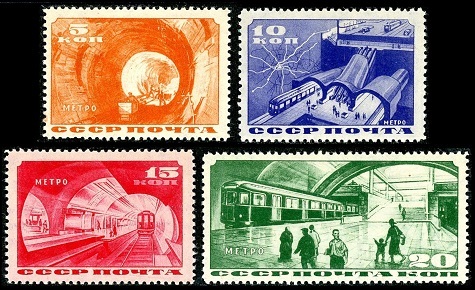 The four pictorial stamps shown above were issued on February 25, 1935 to celebrate the Completion of the Moscow Subway. 05 K. (Sc. #551) - Subway tunnel. 10 K. (Sc. #552) - Subway station cross-section. 15 K. (Sc. #553) - Subway station. 20 K. (Sc. #554) - Train and passengers in a subway station. 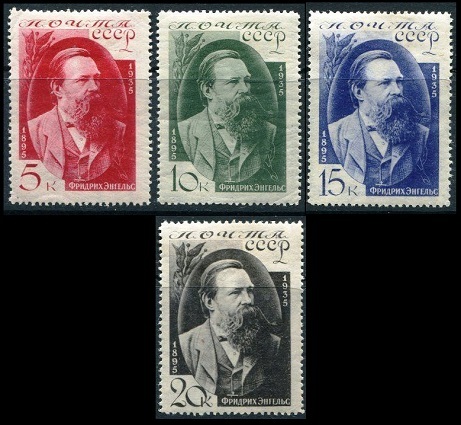 The four pictorial stamps shown above were issued in July 1935 to commemorate the 40th Anniversary of the Death of Friedrich Engels. The common design features an 1877 portrait of Friedrich Engels (1820-1895), the noted German Socialist, credited with the development of "Marxist Theory", and the co-author, along with Karl Marx (1818-1883), of the "Communist Manifesto" and "Das Kaptial". 05 K. (1935 - Sc. #555) - Carmine. 10 K. (1935 - Sc. #556) - Dark Green. 15 K. (1935 - Sc. #557) - Dark Blue. 20 K. (1935 - Sc. #558) - Brown Black.